How did Stoke get relegated with this guy as their talisman last season?! We guess it says quite a lot about Charlie Adam and co…! 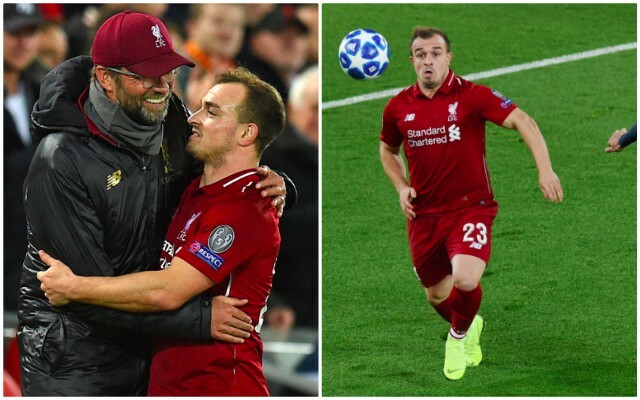 Xherdan Shaqiri was excellent once again last night and excelled as a playmaker in Jurgen Klopp’s 4-2-3-1 system v Red Star Belgrade. The Reds ran out 4-0 winners to end a relatively drab period in front of goal for everyone. With Fabinho and Gini Wijnaldum as a midfield pivot, the Swiss was given licence to roam around the final third, play forward passes, dribble and get close to Mo Salah, for whom he created our second goal superbly. The deftness of touch was a thing of beauty, but his pass that led to our opener was arguably just as impressive. To think, we acquired Shaqiri for around £12m – which considering he’s only 26-years-old – is truly phenomenal business.